Somewhere around the turn of the 20th century, the father of modern advertising and a pioneer in marketing, John Wanamaker said, “Half the money I spend on advertising is wasted; the trouble is I don’t know which half.”For nearly 100 years, no one truly knew the effectiveness of their marketing. During this time, Wanamaker perfected the use of coupons and offers, which were, until the Internet gained mass adoption, the only way to track and measure an ads effectiveness. This lack of ability to track marketing effectiveness led to the large Madison Avenue ad agencies focusing on brands and branding. They moved away from direct marketing, with it’s ability to track and measure, and toward feelings, ego, and mindshare. Famous direct marketing genius Claude Hopkins showed in 1923 how marketing could be tracked and measured. But it wasn’t en vogue. Ad agencies made money off large companies who had piles of cash to waste — for tax purposes. In 1979, Coca-Cola aired the classic Mean Joe Greene ad. In the ad, a young boy bumps into Mean Joe Greene, a then famous all pro defensive tackle for the Pittsburgh Steelers, in the hallway after the game as Mean Joe is headed for the showers. The boy hands Mean Joe a Coke. Mean Joe takes it and downs it in one huge gulp and walks off. The boy bows his head and turns around to walk off. Then he hears Mean Joe behind him say, “Hey kid! Catch!” and Mean Joe Greene tosses the boy his jersey. The VP of Marketing at Coca-Cola, a man named Sergio Zyman… pulled the ad! Cancelled it! … it didn’t increase sales. Sergio Zyman was the first to show that marketing and advertising is about one thing: making money. He invested the time and energy to track and ensure that he knew if his ads were making money or not. No matter how much the world loved the Mean Joe Greene ad, it didn’t sell more Coke. Today, we are 1000 times more sophisticated than Sergio Zyman was in 1979. In fact, not only can we use the same systems that Coca-Cola uses to automate their marketing, we can run circles around them with our agility, and speed — regardless of how many marketing execs they have on staff. Marketing automation has become necessary in today’s business world. What is marketing automation and how does it help you grow your business and understand your marketing? Marketing automation is an ability to track consumers as they interact with your marketing. It’s an ability that the internet gave us. Marketing automation integrates Customer Relationship Management (CRM), with many other automation modules to ensure that a business, as a whole, runs smoothly and efficiently. Depending upon the platform used, it makes your entire customer facing operation and it’s functions trackable. Now, when someone comes to your website, they are tracked. Anonymously at first, but if you can get them to engage with you and download a free report in exchange for their information, for instance, you can track them every time they come back to your website. You can send them emails based on the actions they take on your website, and you can track them as they come back to your website from the email. You can use retargeting ads on other peoples websites, and know when they come back to your website. You can nurture your prospects over time, make offers, let them make purchases, follow-up, and more — automatically. Marketing automation is a Godsend for all marketers, and if you aren’t using it, you are handicapping yourself. Mindwhirl currently utilizes the automation platforms of four vendors: Hubspot, Infusionsoft, and Ontraport. Each has slightly different abilities and functions. Your choice will depend upon what you would like to accomplish, track and measure. I’ve seen companies that were barely subsisting implement marketing automation and grow in this recession (depression). Every company who implements marketing automation receives massive gains in efficiency, and revenue. 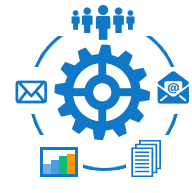 If you would like to learn more about marketing automation and how Mindwhirl can help you implement a system that performs 80% of all your marketing tasks perfectly 100% of the time, contact us today!